비오톱(biotope)은 특정생물군집의 서식지로서 각각의 비오톱은 고유한 환경속성을 가지며, 그로 인한 독특한 생물군집을 형성한다. 서울지역의 비오톱 유형화 작업 결과 8개의 대분류 및 65개의 세분화된 유형이 도출되었다. 비오톱유형에 대한 평가는 목적에 따라 다양할 수 있는데, 자연보호를 목적으로 하였을 경우의 비오톱 유형 평가결과는 그림과 같다. 1등급 비오톱유형은 대상지 전체에 절대적 보전이 필요한 비오톱 유형으로, 자연형과 근자연형 비오톱 유형 중 특별히 보호할 가치가 있는 비오톱 유형이 해당된다. 5등급은 부분적으로 개선이 필요한 비오톱 유형을 나타낸다. 평가결과 1등급과 4,5등급이 차지하는 면적이 상대적으로 많아 서울의 토지이용이 산림지역과 도시화지역으로 양분되는 현상을 반영한다. Biotope is the habitat for a specified species and each biotope has its own environmental characteristics on which forms specified lives. 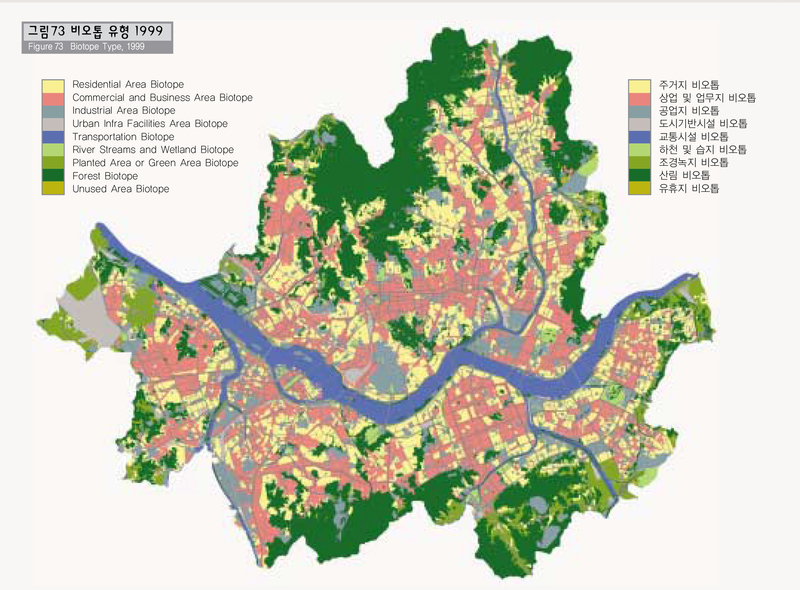 In Seoul, 8 large biotopes and 65 specified biotopes have been identified. Evaluation of a biotope can be divided by its purpose. The map shows the result of evaluation of a biotope type for the purpose of environmental protection. The biotopes, which need absolute protection for the entire region of the biotope area, belong to a 1st grade biotope. Between the natural, which are not cultivated by humans, or semi-natural biotopes, which need special protection, are included in this category. On the other hand, biotopes, which are only able to partially improve the region for a natural environment, are categorized as 5th grade. In Seoul, 1st, 4th and 5th grade biotopes prevail. 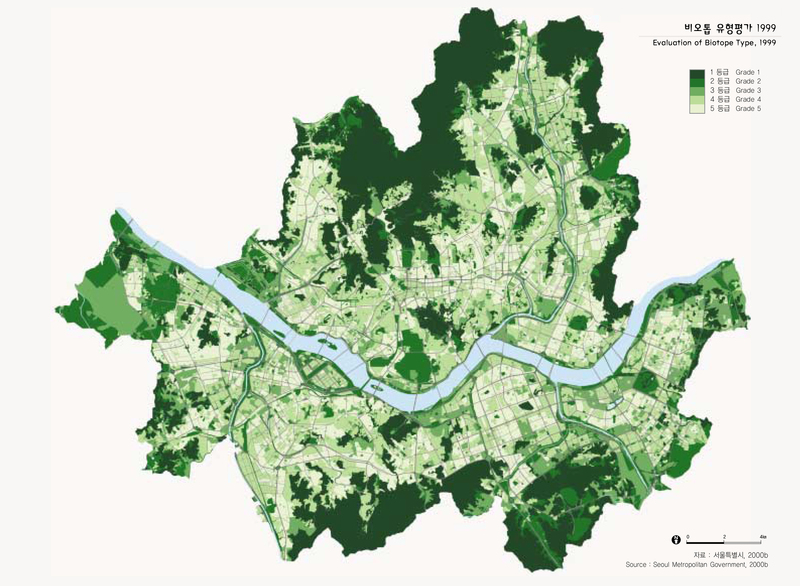 It reflects the fact that land use in Seoul is divided into two groups; one is a forest area and the other is an urban area.